The Crusader offers practical solution to most down light applications. 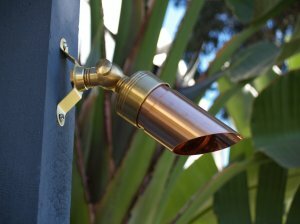 Featuring a dual o’ring supported shroud this down-light fixture uses the Universal Mounting Bracket to make installation fast and easy. The Crusader is equipped with a 35 Watt MR16, 4,000hr Halogen lamp, 25’ of #16-2 low voltage wire and a 15 Year Warranty. This fixture is also available in 24 volt. BodyPrecision formed from copper. Body design provides enclosed, water resistant wireway to protect wires. Features an integral knuckle for maximum mechanical strength. High temperature dual silicone o-ring for water-tight seal. Machined brass knuckle with a solid brass adjustable thumb screw. Vertical tilt of 270° and horizontal rotation of 360° for easy aiming. For use with a halogen lamp up to 35W MR16 lamp.